CBC’s ‘Canada Reads’ names its winning novel, just as the United States’ PBS network says it will stage an ambitious eight-part ‘best-loved’ book show of its own. 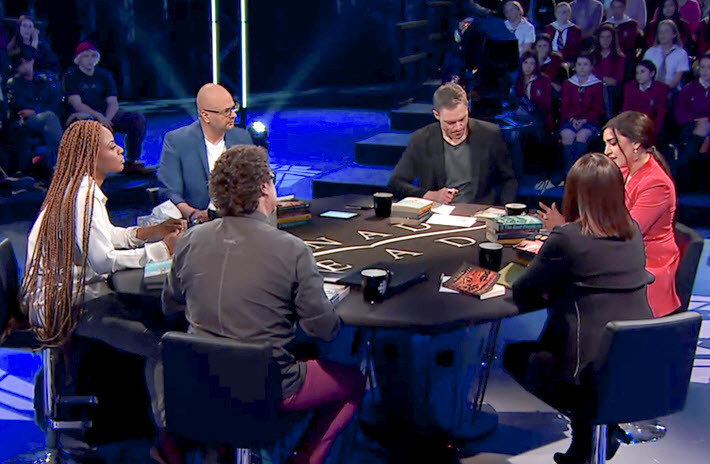 As CBC Books’ absorbing four-day Canada Reads televised event comes to a conclusion today (March 29), there’s news that a similar American show—The Great American Read—is coming to PBS on May 22. 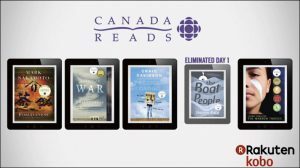 As Publishing Perspectives readers know from Carla Douglas’ prior coverage, Canada Reads, with its theme “A Book To Open Your Eyes,” is the Canadian Broadcasting Corporation’s national-debate program from executive producer Tara Mora, which eliminates four of five carefully chosen socially relevant books in a four-day sequence of debate. 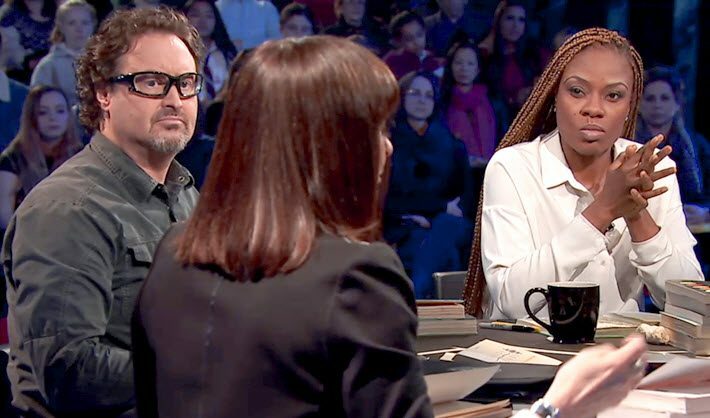 This year’s presentation, played out before a live audience, is marked by charismatic advocates–the celebrity personalities, each of whom defends one of the five books. The show’s look is clean, contemporary, and cool with long, traveling shots and an honesty about its workmanlike lack of flash: the literature is the thing. The book-defending personalities are articulate and well-prepared. There are tissues on the table: one or another advocate will be crying from time to time, overcome by the force of a story being examined. A lot of the discussion is unabashedly geared toward issues with which the Canadian populations, plural, are grappling, clearly mining the country’s new literature for its context on this diverse society and what so many distinct peoples can become as one nation. At this writing, three books have been eliminated: The Boat People by Sharon Bala, Precious Cargo by Craig Davidson, and The Marrow Thieves by Cherie Dimaline, one of the best known of Canada’s Indigenous voices, an author from the Georgian Bay Métis community. 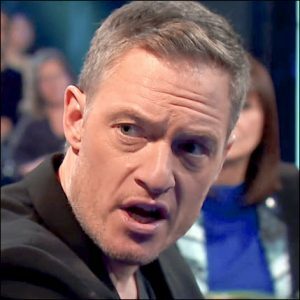 Still standing, then, are Forgiveness by Mark Sakamoto, which is defended by Jeanne Beker, and American War by Omar El Akkad, defended by Tahmoh Penikett. 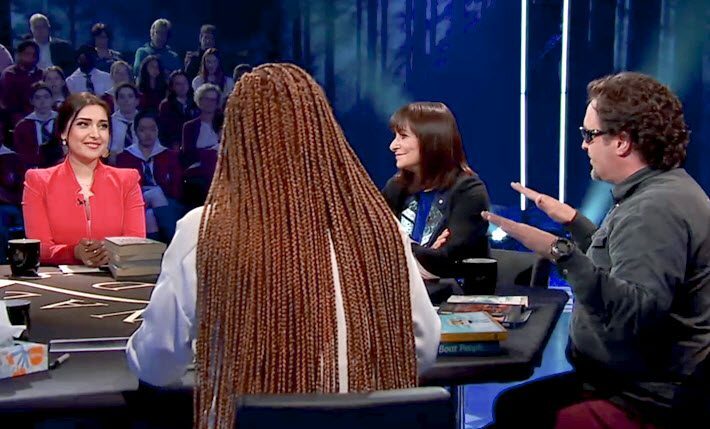 Update: the competition and the show has concluded, with Mark Sakamoto’s Forgiveness winning, the selection championed by Jeanne Beker on Canada Reads. Here is the CBC Books announcement of the show’s outcome. 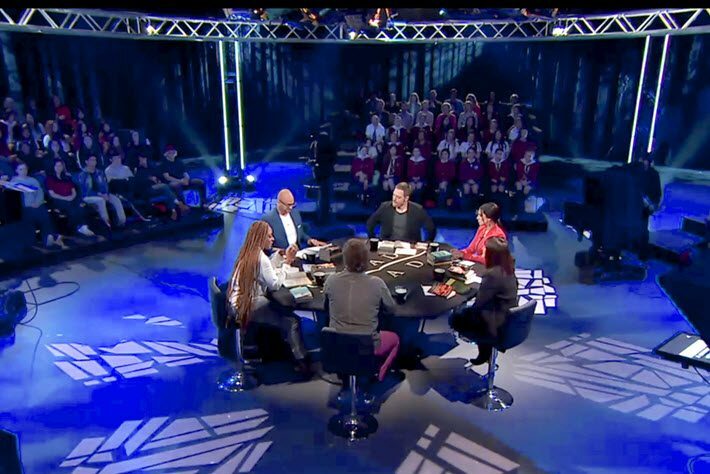 Some of the strongest points about the show’s design include the fact that once a celebrity advocate’s book is “voted off the island,” if you will, that personality doesn’t leave the table, but remains to debate and discuss. And in Wednesday’s (March 28) show, some might have found it surprising that host Ali Hassan alluded to how much emotional attachment these personalities have for their books and their stories: one of the most compelling elements of the show is to see how personally invested these “defenders” are. They speak with candor, frequently on raw political topics. Fashion journalist Jeanne Beker talks of how little she was taught about racism in her society when she was younger–and of her distress over learning of Japanese-Canadians’ internment during World War II. And the Kabul-born Mozhdah Jamalzadah, called “the Oprah of Afghanistan” with glitter on her eyelids, admits to the group that before reading the five Canada Reads selections, she’d always chosen books she felt sure she’d enjoy, rather than more demanding reads that bring the world into new focus. Rather courageously, she confesses that it took her 14 days to get through one of the selections because it’s such a painfully telling read in terms of her own experience of immigration. We’ll embed video of the Day Three program for you at the end of this article. (The show is also heard on radio and in podcasts as well as in its televised iteration.) The Day Four concluding show should be well worth its audience’s attention. In the Day Three tape, you get a sense for how gratifyingly serious this effort is from the actor Tahmoh Penikett, who’s defending Omar El Akkad’s acclaimed American War. The book is a futurist’s warning set in 2075, In El Akkad’s vision, America is an armed continent of war zones and refugee camps, a place in which intolerance and isolationism has won a wretched victory. If you’re short on time, roll in to the 01:10:00 time code in the video, to hear Penikett commending the CBC, in fact, for its focus on Canada’s ‘First Nations,’ its many Indigenous peoples and their cultures. He’s obviously moved by El Akkad’s work and finds it driving him to the heart of Canada’s contemporary dilemma. “The last government (of Canada) was trying very effectively to get rid of the CBC. It would have been a very strange time in Canada if that had actually happened. The interplay of literary value, the books’ relative social merits and visions, these cool-blue production values, and the eloquent personalities of the discussion should make Day Four memorable. Mora and her team will have staged a demanding, four-day exercise that not only raises up its five chosen books for deserved attention but also makes the case for serious literature’s potential in a world crowded with lighter-weight entertainment. But Where Are the Authors? You have to wonder what happened to the authors. Isn’t there some way in which these important people could be engaged in the show? No show is perfect, nor need it be. And no drawback mentioned here in any way diminishes the value of Canada Reads, but might be noted for future consideration. For example, at least one savvy viewer has pointed out that in an apparent desire to have lots of young people in the live audience, the show has ended up with what seems to be a rather disengaged-looking crowd of more than 200 mostly youthful folks in the studio. There’s nothing wrong with having young people along, of course, but it’s possible that a mix that included some truly motivated citizens–some with more mileage on them–might help surround the table with an energy closer to the superbly inclusive and crackling issue-driven commitment of the five advocates. Lots of these kids just looked bored. And most curious of all, you may find that you miss the authors. With the show in its hell week of back-to-back live production, this is no time for us to ask for an explanation, but we’ll see if we can’t get some insight into the thinking on this point later. The show is taped without the authors on-hand and little if any representation of them, either. Plenty of shots of the titles’ covers and a goodly use of books’ trailers will certainly please publishers and consumers. Still, you have to wonder what happened to the authors. Isn’t there some way in which these important people could be engaged? Easy answers don’t spring to mind. Nobody wants to put the accomplished writers of these five fine works through undue stress, and it would make no sense to parade them as if they were on trial. And yet, you can’t help but wish there were some chance to hear something of their reactions to the lively, pointed debate at hand. Overall, though, Canada Reads is at times exhilarating for its depth of critical thinking and always is well worth its time for the quality of intellectual nourishment it brings to the table. This is a show that needs to be developed for more than one annual outing. If this is how Canada Reads, a lot of us will follow them anywhere. As the Canadian show approaches its conclusion for this year, it appears that some of its moxie may have been noticed at PBS, the United States’ Public Broadcasting Corporation. The series has an interesting structure in which it will surface, and then disappear for a while. After the May 22 opener, “and throughout the summer,” press materials say, Americans “will be encouraged to read and engage in the conversation by participating in local events” and voting for their favorite books on the list” at the website. The show will then return in September with “additional themed episodes exploring the nominated books, leading up to the reveal of ‘America’s Best-Loved Novel'” on October 23. Armchair critics will note that this sounds like a one-off venture. 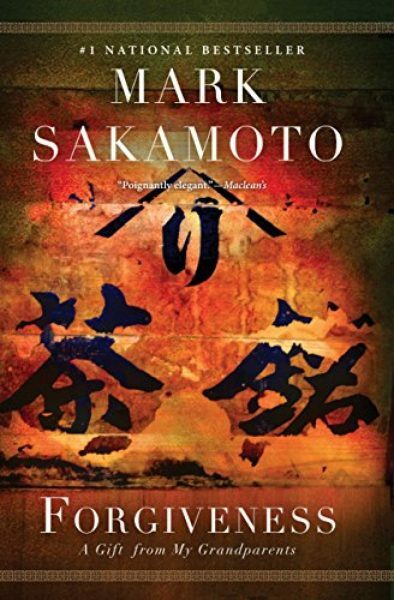 Once the “best-loved novel” is ordained, does another season look for the country’s “second-best-loved novel”? What’s more, the American love of superlatives may make “the best!” attractive, but one of the Canadian show’s strengths is that it holds up all five books for their quality and doesn’t place as much emphasis on a winner and, perforce, losers. Nevertheless, the new outing is to be welcomed, it’s unfair to critique it in advance, and its mission and format need not match the Canadian show. PBS has announced lots of star-power as being involved, dropping names including Margaret Atwood–our Canada Reads friends will want to remind us that she is theirs, not an American–and Jenna and Barbara Bush, Chelsea Clinton, Junot Díaz, Morgan Freeman, Lauren Graham, John Green, Gayle King, George R. R. Martin, Shaquille O’Neal, Sarah Jessica Parker, Jason Reynolds, Gabrielle Union, and Ming-Na Wen. A parallel PBS Kids Read program for children aged 2 to 8 is to be aired, as well, with Nutopia the production house handling the show for the network. Participatory programming is in the offing for PBS’ hundreds of affiliate stations. A “fully illlustrated book” is to be produced as a tie-in by Black Dog & Levanthal, publishing in August, and the production is underwritten by PBS and the Anne Ray Foundation. Here’s the Day Three tape of Canada Reads for your review. See more episodes from the week here. More from Publishing Perspectives on book awards is here. And more on ‘Canada Reads’ and the industry in Canada is here.